Upon leaving Inđija, we had some coffee and ice-cream for breakfast. One scoop was a size of three normal ones and cost 40 dinars – 0.35euro (I might have mentioned that before, but I’m still in owe). Although my banana flavour tasted like lemon, it was still really good. Coffee (70 dinars = 0,50 euro) was crap, but you know, you can’t always get what you want. 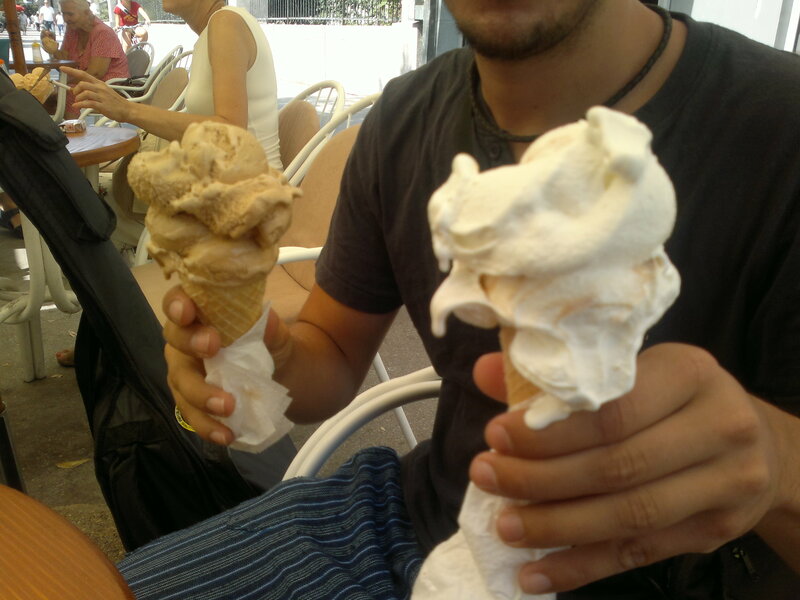 Our ice-cream. So big, so cheap, so good! This time it wasn’t so easy. We had to walk all the way from the city to the pay toll. It seemed much less in the car. And with Igor complaining all the way, it seemed even longer. OK, we are here. Let’s begin. 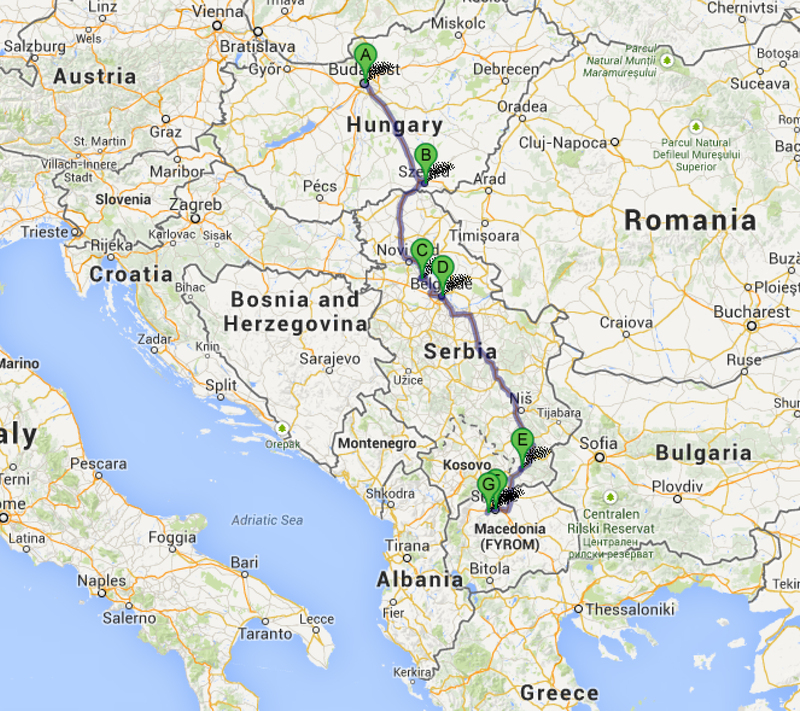 Part1: From pay toll to Belgrade. Waiting time: 20 minutes. A really nice, but a bit crazy driver from Zadar took us. wanted to make sure he’ll leave us at a right place, so he called his wife so that we could explain here where we want to go in English. Really fun ride. By the way, as it turns out, it’s completely normal to use rear gear at Serbian highways :). Part 2: Belgrade – Vranje. Waiting time: 30 minutes. After a short while Marian, a Serbian truck driver stopped to take us with his truck. He was going to Vranje, a city close to the Macedonian border. We felt bad all the way we couldn’t communicate well. We tried some Polish-Serbian mix, but it which worked more or less, but it wasn’t enough for a decent conversation. We got out at the outskirts of Vranje. It was already late and dark, no way we could continue today .Marian left us at the exit to Vranje, so we had to walk about 500m to the gas station. The way wasn’t illuminated and we didn’t have any reflective bands. Tip for backpackers: it’s really important to have something to be visible at the road, better safe than sorry. It’s decided – it’s our next purchase. We slept directly at the gas station. By now, we don’t care anymore about hiding. Dinner: Noodles with bread crumbs – Yummy! The next day everything was going quite smoothly. 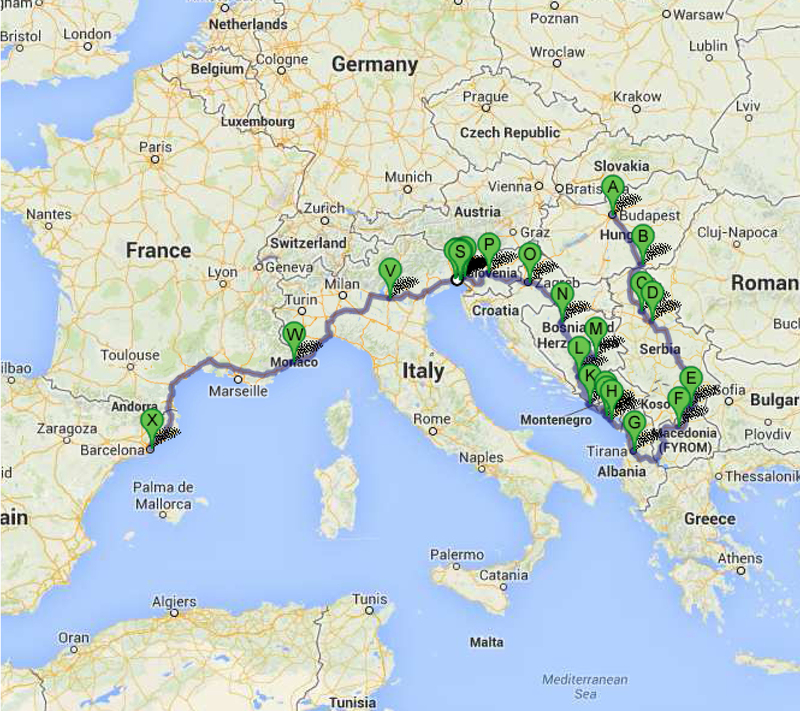 We arrived to Skopje in two goes: first we caught a ride to Serbian-Macedonian border. We passed the border walking. We were so busy arguing, we didn’t even realize we are stepping on the Macedonian land. 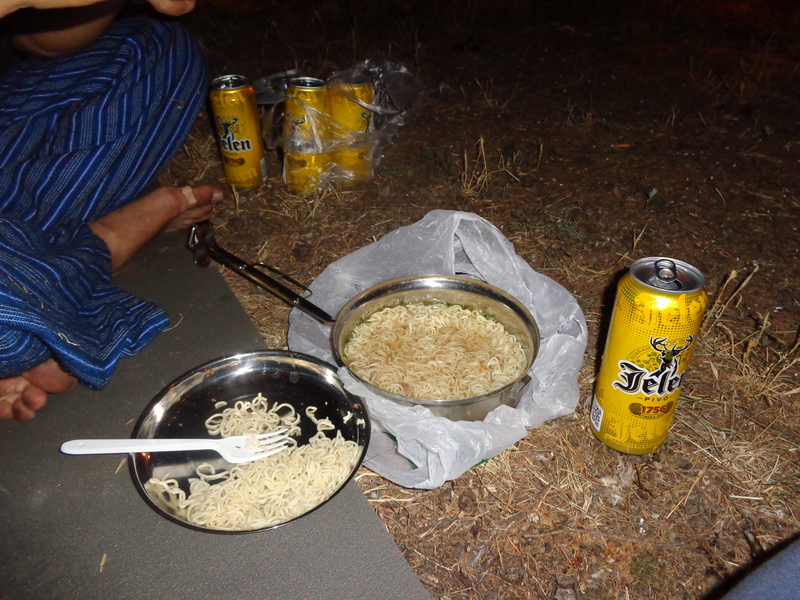 We were stopped by the policeman, who concluded we are Polish-Spanish backpackers mafia. He let us through anyway. Upon crossing the border we already knew that gypsy beggars were ruining our business. We decided to try our luck. Fortunately we look (and are) too poor to attract them. We waited about 20 minutes, but it was clear people were annoyed so they either didn’t want to stop or and drove away in anger. Apart from that, strong smell of piss was hard to bear. We had to move. We moved 20 m away and all we had to wait to catch a hike was 5 minutes. 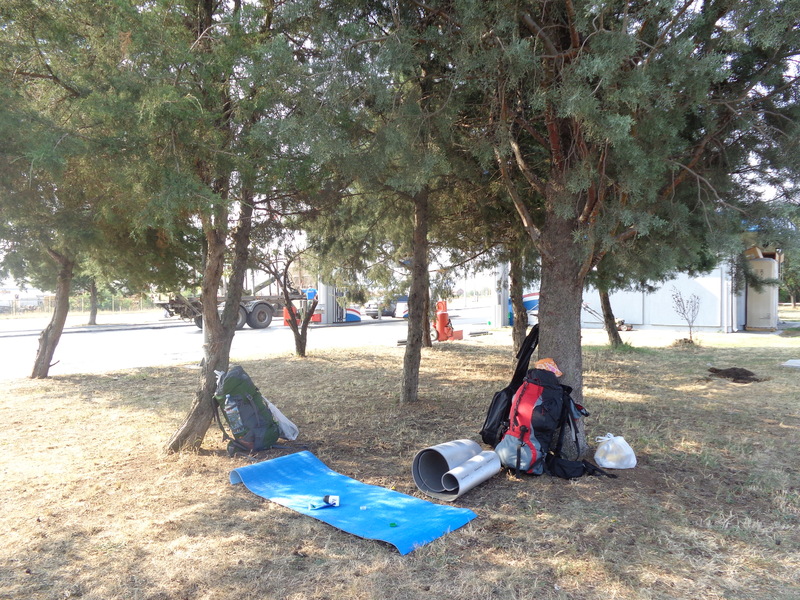 A Macedonian trucker, Igor stopped to take us to Skopje. He knew some Russian so we could communicate mixing Polish, Russian and Macedonian. After 30 minutes we were in Skopje. Trip Inđija – Skopje in 24 hours. Could be better, but you know, it’s all about the journey!